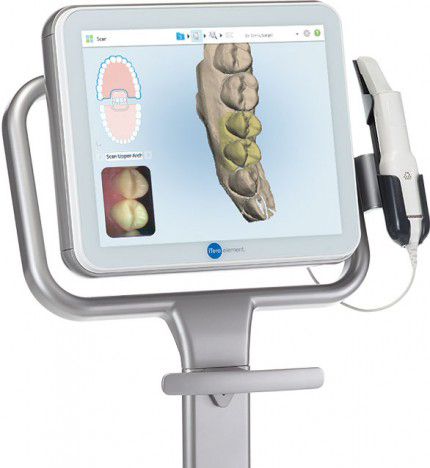 White Rock Orthodontics is excited to announce our new iTero Element digital impression system. With the iTero element scanner, we can now make your orthodontic treatment more comfortable and more efficient than ever before and we can eliminate some trips to the office. With this scanner, we no longer have to take impressions of your teeth with traditional impression materials. Instead, we scan your teeth to create a 3-dimensional model of your teeth that is then digitally sent to Invisalign to make your aligners. We can also send these scans to dental laboratories that can make any appliance that you may need to correct your bite. We can scan your teeth at the appointment BEFORE you get your braces off and ask the lab to digitally remove your braces. From there, the lab can make you perfectly-fitting retainers that are waiting for you at the appointment where your braces come off. This will save you a trip to the office! The scans are more accurate than traditional impressions and you are able to receive your aligners and appliances faster because we no longer have to physically ship your impressions to the lab! White Rock Orthodontics is committed to the latest techniques and technology to help make our patients’ treatment more comfortable and efficient.